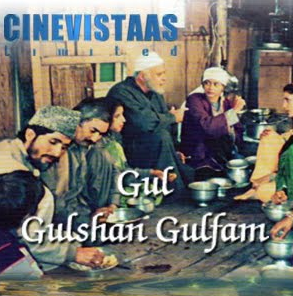 Episode 10 of Hindi TV Serial – Gul Gulshan Gulfam – focuses on human nature. By nature human beings are social animal and we need warm feelings of our loved ones to be happy, to share our joys and to get support while things are not working in our favor. Money can buy you a lot of things, but anything cannot replace the joy of togetherness. The feelings of being loved by someone be it a brother or sister, parents or uncle and aunt, friends or family members, spouse or lover… the true feelings are irreplaceable by all means. We see that the wealthy lady staying at Haji Khalik’s boat house tries occupying herself with reading. But when she hears sounds of joy her attention drawn towards what is happening outside. She see that the entire family of Haji Khalik – the three generations – all sat together for lunch at the bank of the Dal lake. They are enjoying the moment of togetherness! After a while when her maid came to inform her that his son got asleep. She ask her to sit down. And then tells her about how precious is the time, Haji and his family is lucky enough to share with each other! She then tell that as her husband is a busy man, they are unable to spend such quality time together! The sentence by the lady covey something like this: If someone can give such moments of satisfaction, love and joy, then if we have to give him everything we own, I will be happy to do so! The dialog delivery of the actress playing maid (actually she may be a nanny for the baby boy) is artificial. The moments of joys are not over yet! While taking lunch they got a good news that Nisar, son of Noor (the eldest son of Haji Khalik) and grandson of Haji Khalik, is passed in the examination and now became a Doctor. It is of course moment of joy and proud. Haji was unable to control her feelings. A very realistic portrayal of such moment. See the body language of Parikshit Sahni and Radha Seth in the scene and you will understand why they are called one of the finest talents. See the way Parikshit acts when conveying such good news to his customers! This is what it is called as acting! The next scene indirectly shows you how people in Kashmir stores their grains in their boathouses. Noor however was in tension! Actually there is something more written in the letter by Nisar which was the cause for the same! What was that? Well, that is something we leave for you to watch. See how a genuine family behave after such a nice moment of joy. Haji and his family visits the mosque and donates something which they can. Thanking God for something good happened to you and your family is a great gesture. Also see that a child is always close to his/her mother, regardless of the age. The thing which is reason of worry for Noor must have to be conveyed to his parents, however he is unable to gather the courage to do so. When asked by his wife that she can try conveying it to Haji, Noor refused. Noor doesn’t want his father to get shocked by hearing that. He decided to convey it to his mother as she is the better person to convey the stuff to his father properly! Yes, this is what we see in early years of childhood. A child demands something or convey something to his father via his/her mother. And the same remains throughout the life! Oh, this bond of emotions! One other thing you must note is, Noor doesn’t need to ask her mother that he want to convey her something! A mother can sense automatically when his child is in dilemma! May that is the bond of blood! Noor is definitely the wisest son of Haji who not only loves him but also understands him, and that is why he don’t want to convey anything to him, which make him sad. And, a mother always have a solution for any problem! And his mother asked him to not to worry, she will take care of conveying it to Haji at right time, in right way. The portrayals of such emotions, the real situations, the real life and incidents, makes the serial must watch, for sure. That is not all, there is something more in this episode regarding Haji’s daughter and her future. Overall a nice episode with good acting by a majority of cast. The background music is nice. The scenes are written authentically. The dialogs are taken from the real life, they are fantastic. The sets are real. Our personal verdict, you shouldn’t miss it! The episode is no more available on YouTube to view publically.